Kai Lan is a common Oriental vegetable that is usually consumed by the Chinese stir-fried or blanched and dressed with oyster sauce. For local Malays, a popular way of cooking it is to stir-fry it with salted fish a.ka. kai lan ikan masin that you can order from almost any Malay restaurant here in KL. Kai Lan or Chinese broccoli is related to Kale, Broccoli and Brussel sprouts, hence the similar texture and 'bitter' taste. The 'bitterness' of Brassica oleracea L. var. 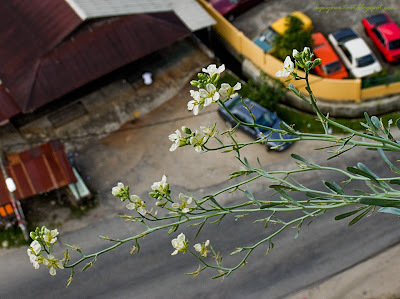 alboglabra is due to the release of glucosinolates when the plant tissues are attacked or bruised. These compounds in reasonable quantities are know to have health benefits, hence a dose of cruciferous now and then is good for you. Kai Lan leaves have such an interesting texture and colour. Well, most of the Cruciferous vegetables do. My first experience with growing Kai Lan started last year with the arrival of the seeds from Diana and boy did they do well in the balcony. In the early stages, I picked the young seedlings as micro-greens and discovered that were really sweet and tasty. With a cabbage-like sweetness and none of the bitterness of matured Kai Lan (or cabbage for that matter), I was eating it it raw. 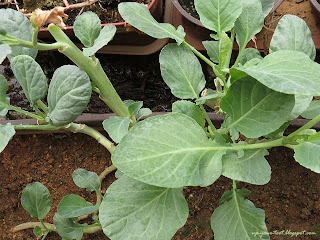 Hence I had to order more seeds from Diana, knowing that it is difficult to produce seeds of Brassicas if I go on picking them off as micro-greens. 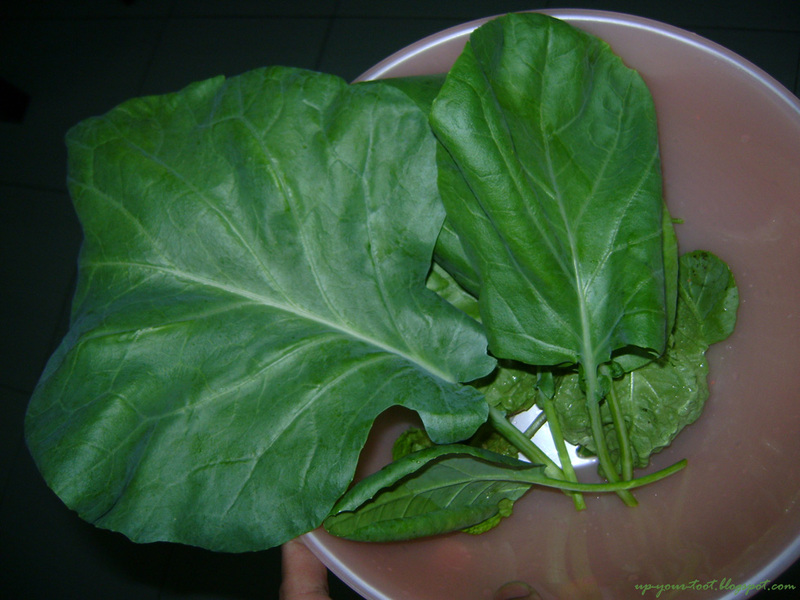 I pick a handful of Kai Lan leaves now and then to add to soups or noodles. Only a handful made it past the 'baby' stage as the rest met with untimely death in my salads and stir-fries. 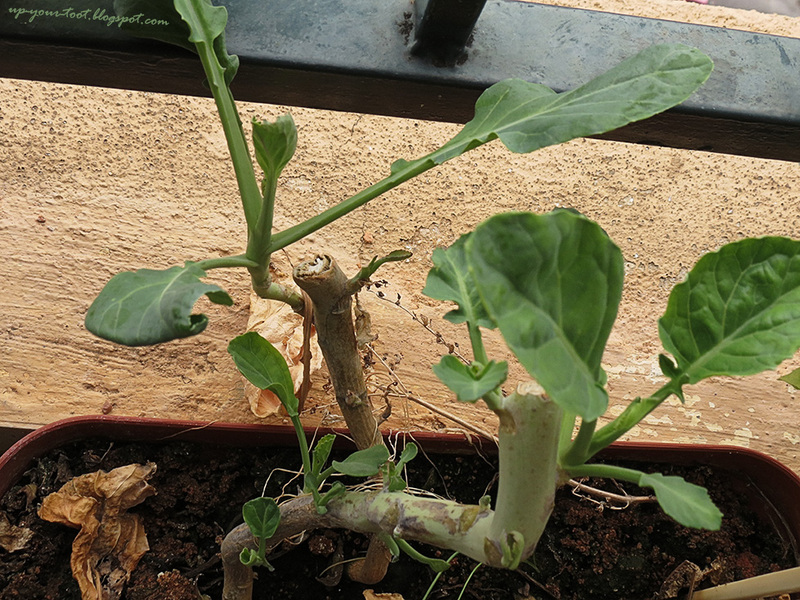 As the remaining survivors grew, I picked the leaves now and then from those plants without cutting the stem away. Thus, it was more like a pick and come again vegetable for me. After several good batches of leaves, the hot weather towards the end of last year resulted in the plants bolting. The white flowers looked pretty so I kind of let them bloom, though I did pick it now and then as they add a spicy touch to salads or soup. However, most remained on the plant as it was also a nice sight to see them hanging out on the balcony, swaying with the passing breeze. Lovely white flowers of Kai Lan (Chinese Broccoli) swaying in the wind. Pretty, but gives me vertigo looking at them as it is 13 floors down to the road below. As time passes, some of the unpicked flowers developed into pods. As expected, all the pods that formed were sterile, as the plants were all flowering at different times or there were no insects to help with cross-pollination. 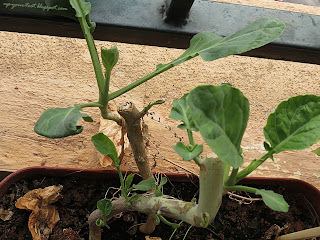 So last week I decided to decapitate the massively branched flower stalks. Not wanting to waste any of the leaves (including the small, lance-shaped ones on the tips of the flower stalk) I picked them off and made a bowl of soup with it. Surprisingly, it tasted OK. A little stronger in terms of the Chinese Kale taste, but definitely edible. The woody stems making a point to show that there is still some life in them. Now the tough stems have put forth more side shoots. So looks like the Kai Lan is here to stay...a little longer. They are indeed resilient and worth every bit of space given to planting them. Here's to another round of Kai Lan from the balcony...Cheers! Making a comeback after being topped - looks like baby Kai Lan, but she ain't a baby, she is old. Hehe, you should try kai lan with hum yu. I frequently eat at malay restaurants, and the only leafy vegetable on the menu would be that. 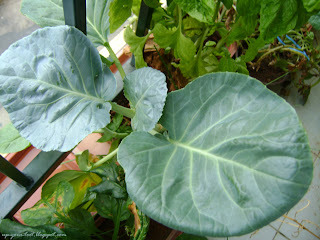 I am happy that kailan makes you want to grow more edibles on your balcony garden. I never had problem with collecting choy sum seeds before. But as you mentioned like yours my choy sum seed were sterile, even with so many flowers. Thanks for making it happen with your wonderful seeds. I am now getting my mum started on growing veges as well. Will mail you a few seeds that I am interested in getting for my mum. simply beautifully captured shots... lovely!